Our friends over at Chewy will handpick items for the winner, which may include treats, toys or accessories. If the winner is a Chewy customer, they will take a look at your account to see what you like. Make sure you let us know if you are a dog or cat (or both) household when you enter! The Lapdogs love their GoDog toys, and the Lapdog Mom & Dad love how well they stand up to tough chewers. Tut thinks the winner will really enjoy making this Skinny Dragon squeak! The whole family can enjoy movie night anytime with this Blue-Ray/DVD in their collection! 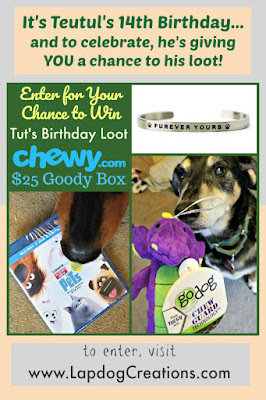 We had fun putting Tut's Birthday Loot package together and hope whomever wins will enjoy the items as much as we do! Disclosure: The Lapdogs are Chewy Influencers and Chewy is providing a $25 goody box for our giveaway. PawZaar, GoDog, and Universal Pictures provided the other prizes mentioned above. This post may contain affiliate links. If you click and make a purchase, I may receive a few pennies which help keep this blog running. Teutul might be the one celebrating the birthday, but he thinks everyone deserves presents! 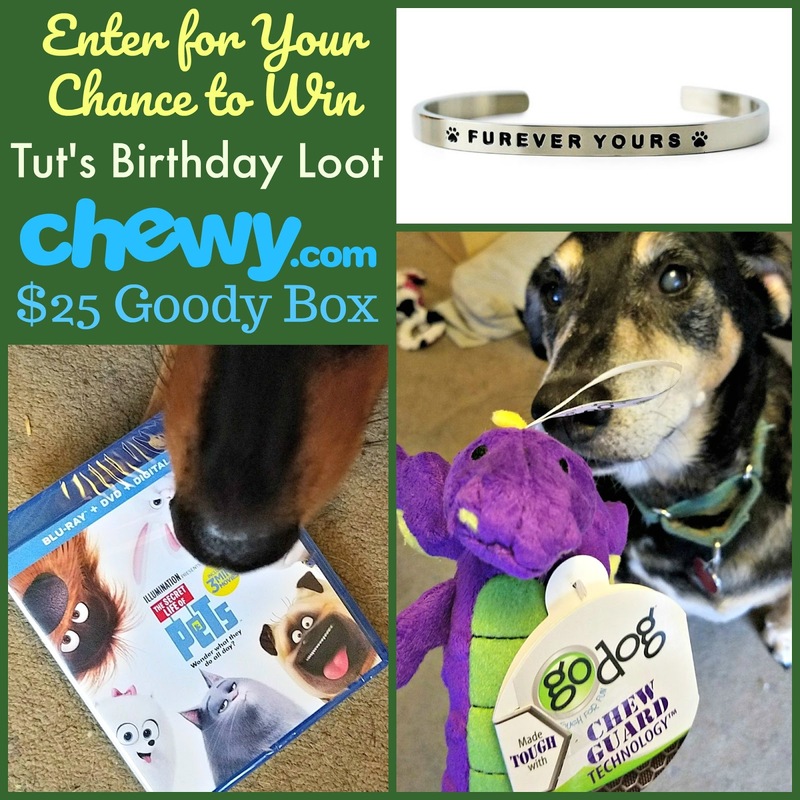 One (1) lucky winner will receive a $25 box of goodies from Chewy, a "Furever Yours" bracelet from PawZaar, a GoDogs Skinny Dragon toy, and The Secret Life of Pets on Blue-Ray/DVD. Have a wonderful birthday, Teutul! Each birthday is a blessing, isn't it? Hope you have many more! Tut, you are a very generous guy to share your birthday loot. Five of us are having birthdsys today and we have to share because there are so many of us. We wish you a wonderful birthday and we'll include you in our celebration. There are nine of us dogs and the two birds say happy birthday too. Have an amazing birthday Tut!Full of ear and belly rubs, and talk wagging fun. You look amazing and sending hugs! Happy Birthday Teutul! Looks like you had a fund celebration! In this house the dog thinks she's a cat and the cat thinks he's a dog. Happy birthday Tut!!! I have 2 dogs and 2 cats! Happy Birthday you handsome little devil! enjoy everyday and celebrate with your companion and be healthy, wealthy, and wise! Happy birthday! My house is home to three little dogs and two cats. We love our animals and all animals! you are having your day! have a wonderful happy bday and many more happies! i hope that you live a very long healthy life. Happy Bday Teutul! fun-tas-tik birthday an'lookin'forward to the next. That shure iz a real nice thing to share your goodiez with the winner. There r a couple of doggiez here - no catz. Happy happy birthday Tut!! !14 is so exciting!!! I hope your day was filled with love and kisses!!! Your birthday is only 9 days after Bella’s! I have one dog and two cats! We're a cat household -- sadly, our pup passed away in June. We are a family of one human and a dog. Happy 14th Teutul! My girl is celebrating her 7th this week! Happy dogday Teitul. You are very generous to share it with others. I have a family of 1 dog and 3 cats. Happy Birthday to Tut, what a cutie. 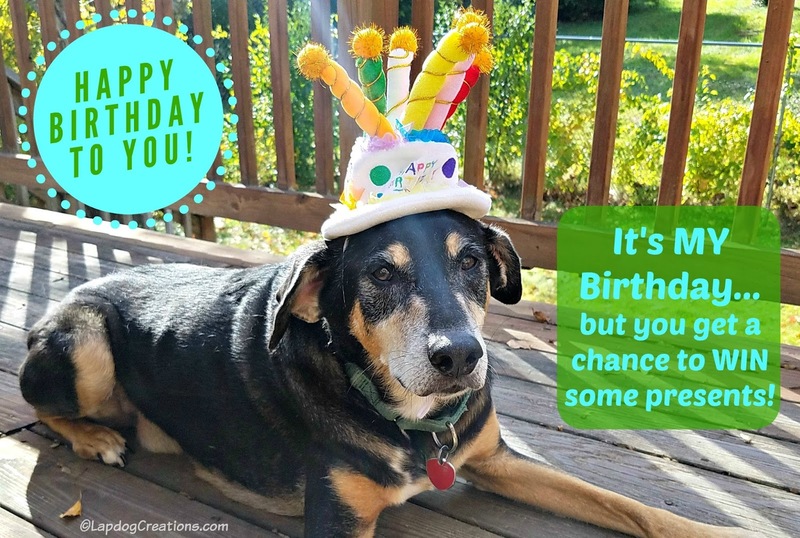 We wish for long romps, plenty of belly rubs, healthy goodies, lots of snuggles, and cake! We are a dog household. Wags! Wishing you a day full of treats, belly rubs, & all the fun you can have!! Happy Birthday! We are a dog house! Happy Birthday Tut!!!!! You are an amazing dog, Tango is watching over you!!! Happy Birthday Tut! We have both a dog and cat (Dexter and Marceline)! Happy Birthday Tut, we are wishing you many more happy ones. We are team dog. We'd love a box for the dogs to enjoy :) Thanks for being so kind and celebrating your special day with a giveaway. Happy Birthday! Hope you have a Chewy good day. I'm a small dog and cat household. Happy Birthday Tut! My dog Molly wishes she could celebrate with you. Oh my goodness! 14 years old!! Happy Birthday buddy! I love senior pups!! My boys (pups) have epic birthday pupcakes every year on their day, so we hope you had a blast on yours! We love goDog dragons and Chewy! Happy happy birthday! We have 3 dogs that love with us. And several Feral cats that are e take care of outside as well. Happy Happy Birthday you handsome boy! Wow, you really look great for 14! My wish for you is that you have a very happy and healthy year ahead of you, a super soft bed to lay your head, treats galore (after all, we should be able to eat what we want when we get older), lots of belly rubs and head pats, bones and toys scattered throughout your house, and lots of quality time with your family!! I have to tell you that when I saw that it was your birthday yet you are sharing some of your loot, it reminded me of my Mother (who's been my guardian angel for almost 21 years now). Whenever it was her birthday she would ask all of her children what we wanted. It wasn't until I was an adult that I realized the significance of her selfless act...which was to teach us the joy of giving and that when you give to someone you gain so much happiness in return. During the holidays especially I really miss my Mom. For some reason she's been on my mind all day today; which has made me sad. However, I was about to head to bed when I saw that you're giving to someone on your birthday just as my Mother did on hers. That in itself has been a gift to me; so I want to thank you for that. Look at that, you've already giving so much more than "things" on your birthday; you've given ME joy! Now when I head to my cal-king bed (I'm the only two-legged person in my house...although I do have a three-legged cat lol) with several cats and dogs snuggled up to me (and on me) I won't even mind that I barely have enough room to roll over. lol I'm just happy that I am surrounded (literally) by so much love!! Thank you again for making me smile; and HAPPY BIRTHDAY, TUT!! Happy birthday Tut!! We are a mixed family of two cats and two dogs :)! Happy Birthday Tut! We have 3 dogs and 3 cats. Happy Birthday Tut. We have 3 dogs and 3 cats. Happy Birthday Tut! I have a 15 year old sweet American Eskimo that is blind, diabetic and bad back legs. I love her so much. Happy Birthday sweet Tut!! We have 2 dogs in our house, a golden retriever and a lab.